I made some Alfredo sauce for you. It’s my new dress, I call it the Nudel™. I’ll bring the sausage and meatballs! Guys, this is obviously a Pastafarian birth. Show some respect! I believe this is a baptism ceremony for the Church of the Flying Spaghetti Monster. 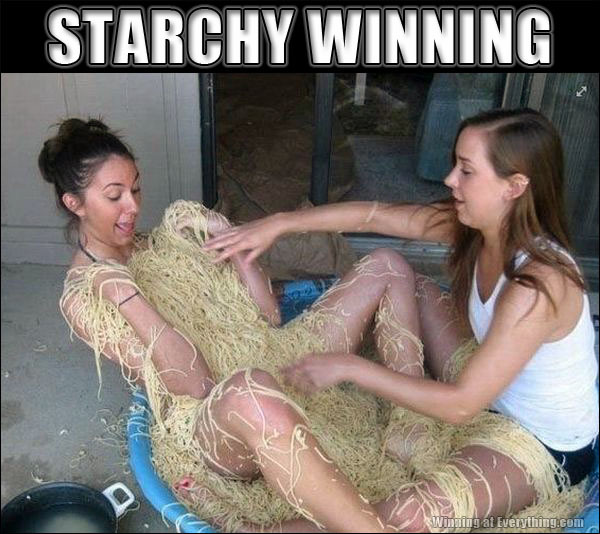 She’s being touched by His Noodly Appendage. She’s making me al dente! Cousin It’s sister gets a full body bleach. I applaud everyone’s restraint from using the “hold the red sauce” joke.